Lyndon Johnson uttered those words in his Thanksgiving address to the nation on November 29, 1963, one week after one of the worst days in American history. Hockey, on the other hand is a game. But in those two extremes and everywhere in between, in life’s events large and small, there is the idea that it is only what lies ahead that anyone can affect by their actions. Yesterday, for the Washington Capitals and their captain, Alex Ovechkin, was another instance of six months of success and achievement undone in two weeks’ time by a franchise that has confounded them since before many of the Capitals who played this season were born. Ovechkin’s season was different than many that preceded it, though. He became just the third player in NHL history to reach the 30-goal mark in each of his first 12 seasons in the league (Mike Gartner and Wayne Gretzky are the others), but for the first time in his career he did not lead the team outright in goals scored. His 33 goals this season tied him with T.J. Oshie for the club lead. 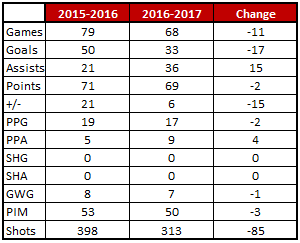 This might be viewed as a good thing, since the Caps finished with a more productive scoring offense in 2016-2017 (3.18 goals per game) than they did in 2015-2016 (3.02), when Ovechkin recorded 50 goals (his seventh such season). On the other hand, his shooting percentage fell significantly, from 12.6 percent last season (just above his career average of 12.4 percent going into last season) to 10.5 percent this season. It was his lowest shooting percentage for a season since 2010-2011, when he finished at 8.7 percent, the lowest of his career, and a full season career-low of 32 goals. Something else was absent in Ovechkin’s goal scoring in 2016-2017 – the consistency. He scored many of those 33 goals in bunches… a four-game streak, three in two games, five in four games (including a hat trick), four in six games, three in two games, and so on. And that meant some lengthy (for him) droughts… a four game streak without a goal in November, a seven-game streak to end November and begin December, a four-game streak in January. And then there was the ominous finish to his season in which he recorded just six goals in his last 24 games, half of them in a hat trick performance against the Minnesota Wild on March 28th. All three of those goals against the Wild on March 28th were of the power play variety, and it was not unusual. For the fifth consecutive season he led the NHL outright or shared the lead in power play goals (17, tied with Nikita Kucherov and Brayden Schenn). The flip side of that fact is that power play goals accounted for a larger share of his goal total (51.5 percent) than in any other year of his career. Ovechkin’s possession numbers were not particularly noteworthy. His individual 50.35 percent Corsi-for at 5-on-5 was seventh-best in his last ten seasons (numbers from Corsica.hockey) and his lowest since the 2013-2014 season (49.36 percent). And while he did enjoy an effective mating with Evgeny Kuznetrsov and T.J. Oshie (56.29 percent Corsi-for, fifth-best of 14 forward combinations skating at least 50 5-on-5 minutes), the nominal top line of Ovechkin, Oshie, and Nicklas Backstrom was less efficient (50.25 percent, ninth-best combination on the club), and his mating with Andre Burakovsky and Kuznetsov was worst of those 14 combinations (43.24 percent, albeit in only 65 minutes together). Fearless’ Take… If anything, Ovechkin’s scoring was better against teams that reached the postseason (18-20-38 in 41 games) than it was against teams failing to reach the playoffs (15-16-31 in 41 games). The goal-scoring difference between the groups was, of course, the power play (10 versus teams making the playoffs, seven against teams that didn’t). And, his scoring mattered, although there was a hint of how secondary scoring is important. The Caps were 21-6-0 in games in which Ovechkin scored a goal, 34-13-8 in games in which he did not. It was in more general scoring in which his contributions seemed to matter more. Washington was 37-9-1 in games in which Ovechkin recorded a point, 18-10-7 in games in which he did not record a point. 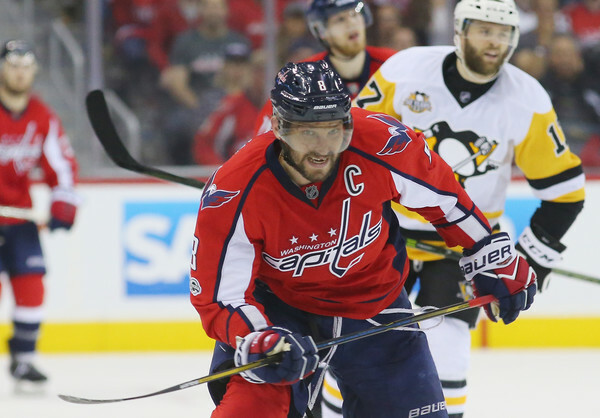 Cheerless’ Take… Alex Ovechkin is a big hitter. Since he came into the league, only three forwards have more credited hits than his 2,484 – Dustin Brown (2,977), Cal Clutterbuck (2,580), and Chris Neil (2,568). And Ovechkin has 138 more goals than those three players combined. That said, does it matter? The Caps were 5-4-2 in games in which he was credited with five or more hits this season, 9-1-0 in those games in which he was not credited with any. Ovechkin also showed signs of not traveling well this season. Coming into this season he recorded 263 of his career goals at home, 262 on the road. This season, that split was 20-13 in favor of home cooking. His hat trick in Minnesota was the only game out of his last 13 road contests in which he scored a goal. Odd Ovechkin Fact… Ovechkin had just one even strength goal in his last 32 games, only one in his last 19 home games. Put another way, he went almost the entire second half of the home schedule with just one even strength goal. Alex Ovechkin has never been one to dawdle when on the brink of milestones. Think of the run-up to his 500th career goal in the 2015-2016 season. He was at 496 goals when he faced the New York Islanders on January 7, 2016, and scored a goal. In his next contest, against the New York Rangers, he scored a pair to get within one of his milestone. Then in the following game, against the Ottawa Senators, he scored a goal in the second period to hit the 500 mark (he added another in that game for good measure). He added a second period goal in the Caps’ 5-2 win over the Penguins. Since he came into the league in 2005-2006, no player has recorded nine or more shots on goal in a game more often than Alex Ovechkin. His total of 76 such games is 57 more than Eric Staal, second on that list (19). In fact, his total is more than the next five players on that list. One of those instances came late in the season against the Dallas Stars at Verizon Center. It was as frustrating as frustrating gets. First, the Caps had lost five straight games to the Stars on home ice dating back to 2010 (0-4-1), the last four of those losses in regulation. Ovechkin was coming into the game on a streak of six games without a goal, over which he had a combined 11 shots on goal and two of those games without any. When Dallas took a pair of penalties in the first period, it seemed Ovechkin and the Caps might break out on the power play, but the Caps went 0-for-2, Ovechkin failing to find the net on any of his three shots. It did not get better. Ovechkin went 0-for-2 in the second period and 0-for-4 in third period to go 0-for-9 in the game that the Caps lost, 4-2, their sixth straight loss at home to the Stars. What a strange postseason Alex Ovechkin had. He scored goals in four of his first seven games of the playoffs (six games against Toronto and Game 1 against Pittsburgh), and the Caps lost three of them. The Caps lost three of the five games in which he recorded four or more shots on goal. They were 4-6 in the games in which he was credited with four or more hits. They were 2-3 in games in which he blocked at least one shot. They were 1-2 in games he recorded more than 20 minutes of ice time. The more, and more active, Ovechkin was on the ice, the worse the club seemed to do, even if his possession numbers were very good. One can call that coincidental, or one can think of it as not being able to pull his teammates along. It is hard to lay all the Caps’ ills at his feet; he did have five goals in 13 games (odd playoff fact…Ovechkin has had exactly five goals in six of his last seven postseasons), and he did play much of the postseason injured seriously enough to require “pain-numbing injections” to play. But that Game 7, the third time in the last four instances the Caps lost a playoff series Game 7 on home ice, is going to be a disappointment that lingers. When Alex Ovechkin finished the 2010-2011 season with 32 goals in 79 games, and then followed it up with 38 goals in 78 games the following season, there were whispers that he might be in decline, that his hard style of play was catching up with him. But he was just 26 years old then, too. No one was whispering about his being in decline or being washed up when he scored 186 goals over the next four seasons (averaging 53.3 goals per 82 games played). This year, at age 31, he had his fewest goals in a full season since that 2010-2011 season, he had his fewest shots on goal (313) since that 2011-2012 season (303). His even strength goal scoring was down for the year and almost non-existent in the last third of the season. But what seemed to underlie his play over large stretches of the season was an almost subdued effort, at least by his standards over his first 11 NHL seasons. In the postseason, he performed well over stretches but rarely seemed to dominate. Ovechkin will be 32 years old when the curtain rises on the next NHL season. When you realize that since the 2005-2006 season, only one player of age 32 or older had a 50-goal season (33-year old Jaromir Jagr with 54 goals for the 2005-2006 New York Rangers), and only six players 32 or older have 40-plus goal seasons over that time, one wonders if we are starting to see the new normal for Ovechkin as he heads into what might be late middle age as a player. If it is true that “yesterday is not ours to recover, but tomorrow is ours to win or lose,” one might start to wonder just how many tomorrows are left for Ovechkin to win the prize that has eluded him.